Health, education, engineering and environmental researchers are leading an innovative project to improve child nutrition, focused on infant feeding practices - led by UCL, with Save the Children, Indian Institute of Technology Delhi (IIT-Delhi) and Jawaharlal Nehru University. The community mobilisation project, known as PANChSHEEEL, is based in rural Rajasthan, India. The project, funded by the UK’s Medical Research Council (MRC) and Global Challenges Research Fund (GCRF), takes a holistic and community view of infant feeding practices, including different facets of nutrition, hygiene, sanitation and parent-child interactions, alongside policy recommendations from both the health and sociocultural perspective. “Malnutrition is not just about the food you give. It is about how food is prepared and fed to the child, but also if a child gets repeated infections, that can leave them malnourished,” said Professor Monica Lakhanpaul (UCL Great Ormond Street Institute of Child Health), UCL’s Pro-Vice-Provost (South Asia), who is leading the project. India faces a triple burden of childhood malnutrition: 38% of children under five are stunted,* childhood obesity is on the rise, and most children have a micronutrient deficiency. The Government of India has been implementing nutrition and behaviour change projects but barriers include outreach, variable levels of sanitation, social inequity, and the effectiveness of local integration. 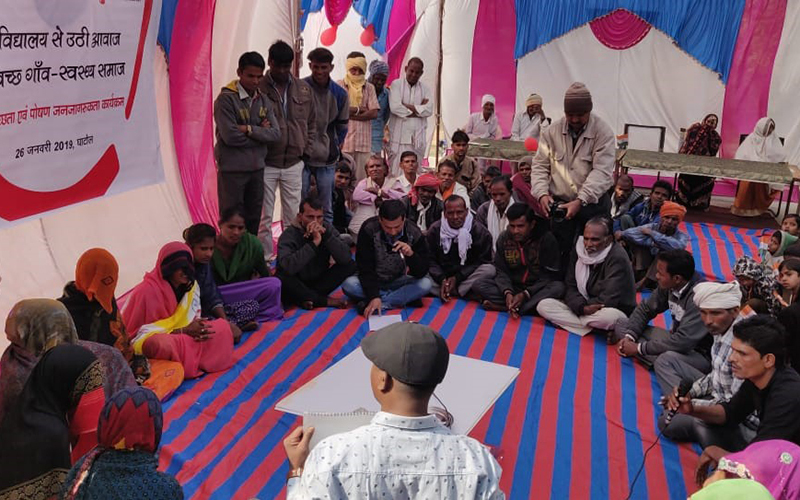 This project takes a participatory approach by working closely with people in rural communities of Rajasthan’s Banswara region, including families and community leaders. The academic leads have been training community champions to engage with their communities, and have been consulting with them at every stage to ensure that every solution has been co-developed with community members. The team has developed a socio-culturally appropriate, tailored, integrated and interdisciplinary intervention package, centred on schools as places of community mobilisation, linked in with Anganwadi (rural child care centre) workers. “Schools are a key part of our intervention as a recognised platform for social change, so we envisage that schools – where communities come together, teachers are respected and children can be change agents even in the homes – can be a forum to enhance existing platforms of community health delivery such as the Anganwadi centres,” added Professor Lakhanpaul. The intervention package, which covers strategies for households, communities, health and education organisations and government, includes teaching people about feeding practices and nutrition for a child’s first 1,001 days and links to infections, hygiene and sanitation guidance such as hand-washing, as well as solid waste management. Project workers will also discuss with families how they interact with their children as part of feeding them, highlighting the importance of spending time with the children, as infancy is a vital period for learning and brain development. Time available to mothers was particularly recognised as a restricted resource. The research team has also mapped out everything that needs to happen for effective implementation and operation of their strategy, which includes policy recommendations and cheaper or more readily available alternatives when necessary. The next stage of the project will be to test out the effectiveness of their intervention. The researchers add that both the research evidence and community-led intervention package have immediate relevance and application for the Indian Government’s POSHAN Mission to improve maternal and child nutrition, specifically to its convergence plans for each level. “Tackling the problem of undernutrition requires cross-sectoral and context-specific interventions. The PANChSHEEEL study has been unique as it has not only collected information on both nutrition specific and nutrition sensitive factors, but also utilised the information effectively for developing the intervention package working together with the community. The emerging design is extremely relevant in the context of POSHAN Mission,” said Dr Rajesh Khanna (Save the Children, India). UCL is deepening its partnership commitments in India, so this project features on a visit to IIT-Delhi by a delegation led by UCL President & Provost, Professor Michael Arthur, on February 21. The following week, the researchers will be presenting their findings at conferences hosted by IIT-Delhi and Save the Children (in Jaipur) on February 26 and 28 which will be attended by Indian Government officials. The project, Participatory Approach for Nutrition in Children: Strengthening Health, Education, Environment and Engineering Linkage (PANChSHEEEL), forms part of UCL’s HEEE initiative, co-led by Professor Lakhanpaul alongside Professor Marie-Carine Lall (UCL Institute of Education) and Dr Priti Parikh (UCL Civil, Environmental & Geomatic Engineering), developing interdisciplinary links between Health, Education, Engineering and Environment. The UCL researchers are also learning from their work in India to improve health systems in the UK. Professor Lakhanpaul is leading a separate project (funded by the NIHR CLAHRC North Thames- NEON project) that seeks to determine whether health models from resource-poor countries, such as parts of India, can be adapted for the UK and implemented in deprived areas such as part of East London, for cost-effective NHS interventions. The project builds on a review of feeding practices in South Asia and is an example of the bidirectional knowledge exchange between both countries.